Junges Europa was a series of "newsreels" for the Hitler Youth put out between 1942 and 1944. There appears to have been seven newsreels total, of which three are presented here. It is clear that the newsreels were designed to run in conjunction with Die Deutsche Wochenschau newsreels, shown in theatres with feature films. Whether the Hitler Youth newsreels were to run only with certain films aimed at youthful audiences is not known. Auxilliary firefighting units of the Hitler Youth go into action; BDM girls become streetcar conductors and ticket punchers; Dutch children in a National Socialist educational camp; A Hitler Youth chior sings at a convalescent hospital; German youth help with the harvest and colonize farms in the annexed East; Feeding wildlife in the Alpine regions; The Hitler Youth Marine in training; Italian fascist youth in a paramilitary training camp. Trainees graduate from the Adolf Hitler School; BDM girls sew clothing for and take care of children from bombed-out neighborhoods; A practice drill with the HJ Marine; In a glider training camp of the Hitler Youth; Hitler Youth train on assault boats. Slovakian youth are trained to become soldiers; Rumanian children in armament plants; German and Spanish youth honor the fallen Kondor Legion airmen in Spain; In a camp for children evacuated from air raid threatened lands in Bohemia and Moravia; Hitler Youth train to be grenadiers and sappers; Hitler Youth train to be Gebirgsjager; German youth do their part in the factories. This film details the work of female volunteers in the service of the Wehrmacht. By 1944, almost all of them were considered de facto Wehrmacht personnel and the positions were no longer voluntary. We see them working as communications officers; anti-aircraft helpers; training horses for frontline duty; firefighting; truck maintenance; etc. The full title of this piece is Hande am Werk - Ein Lied von deutscher Arbeit, and the title is appropriate. This can best be described as a "symphonic poem", with most of the film being music and a pictorial presentation of the various forms of labor, which were making a place for Germany among the top industrial producers of a world deep in economic recession. The economy in Germany was starting to recover under the Weimar government when Hitler took office in 1933; but the Nazis reaped the credit for a sharp turn around in unemployment by launching a massive public works project. At a time when most of the world looked enviously at Germany's falling unemployment rates and the Nazis' success in pulling the country out of the worldwide Depression, a film about and dedicated to labor was no abstract concept the common man couldn't understand. Interestingly enough though, the scenes and messages of the film remind me very much of similar films put out at the time in the USSR, another country, which was able to boast "full" employment in a world where work and bread were hard to come by. One of the first documentary films about the celebration of May Day in 1933 Germany. The leftist unions in Germany had always demanded May Day be made a workers’ holiday. Hitler complied; the next day, he abolished the unions. Moving documentation about the work of the WHW in the early years of the Nazis’ reign in Germany. A comparative study of Germany as it was and now “is” after three years of Nazi rule. Not exactly unbiased. Documentary film about a model National Socialist school in Plettenberg. Another Nazi propaganda film contrasting how it once was with how much better life is under the Fuhrer. Film biography of an NSKK unit’s adventures at home and on the Eastern Front. Interesting, previously unpublished films of ghetto Jews they run into on their way through Poland. This film traces the major events in the Years of Struggle with its termination being the success of the Nazis to take over power in Germany. A review of the situation in Frankfurt shortly before the national elections, in which the Nazis performed their best to date before taking over the Reich government in toto. The atmosphere in the city among the competing parties vying for power is palpably felt. Documentary about the SA put out in 1933-1934, mainly consisting of march music accompanying film bragging about the prowess of the SA. Rather short film, in which Fritz Todt discusses the progress of the highway building program in Nazi Germany. Early National Socialist film praising the joy of working to a country, where unemployment was still massively high. The film documents the rebuilding of the economy through pictures of common people at work. That this reform was started during the Weimar Republic, for which the Nazis were now taking credit, is nowhere documented in this or any other film. The May Day celebrations in Mannheim to the accompaniment of martial music. And yet another film about the May Day celebrations in the early Reich years. In 1936, Germany sponsored both the winter and summer Olympic Games. It was Dr. Goebbels intention that everyone in the county get into the spirit of the Olympic Games and view it as both an honor and a mission, through which the bad press about Germany --- and the Nazis --- could be wiped away, if Germany presented itself as a welcoming and courteous host to its foreign guests. And to ensure national awareness of the Games, a mobile exhibition known as “The Olympic Train” toured around Germany with displays, dioramas and information about the upcoming event. This film portrays the preparation of the train for its journey around the Reich and the setting-up of displays wherever it went. The Jungvolk was the preparatory group for the Hitler Youth, set up for children, who were still too young to join the HJ. This film takes us on a tour of one of these camps and of the region surrounding it. This movie would no doubt be of great interest to those interested in military history. No other documentary allows us to see how certain equipment is used in its most proper way, how it works, how it is operated and so on. Just take a look at the rapid deployment of the PAK guns; their crews fighting off tanks; flak batteries in an air defense role … Such pictures have great learning potential in and of themselves. Scholars of military history can learn very much about the strategies and military doctrine of pre-Blitzkrieg Germany; especially through the well performed maneuvers shown in this movie. Truly essential documentary for anyone interested in the topic. And yet another Nazi propaganda film extolling the virtues of work and honor. Propaganda film shows the kind of training women receives at such institutions prior to accompanying their men on the journey to colonize what is to be future conquered lands. A quick review of veterans and a present-day Wehrmacht honor guard parading in Dusseldorf in commemoration of this day honoring the military. The Reichsausstellung Schaffendes Volk (The Reich's Exhibition of a Productive People) of 1937 was held in the North Park district of Düsseldorf, Germany, along one mile of the Rhine shoreline. It was opened on May 8, 1937 by Hermann Göring. Through October of the same year it attracted more than six million visitors. Planned in secret and deliberately designed as a rival to the 1937 International Exposition of Modern Life in Paris, the exhibition was meant to showcase the domestic accomplishments of the National Socialists in new housing, art, and science during their four years in power. The fair's director was Dr. Ernst Poensgen. Through the publicity efforts of its CEO, Max Keith, a functioning Coca-Cola GmbH bottling plant stood at the center of the fairgrounds, with a miniature train for children, and immediately adjacent to the Propaganda Office. Interesting homage to the man, who was responsible for the upgrading and new construction of highways in the Reich during the pre-War years. If you’re driving on a highway in Germany, there’s a good chance, he had it built. Just as it says: a short film about the Reichsminister’s visit to Limburg. This film shows the events in Holland, when the transfer of power to the new minister for internal affairs, Dr. Seyss Inquart, took place. 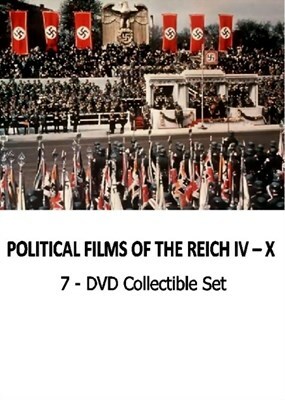 The events leading up to Adolf Hitler being named Reich’s chancellor and the celebratory procession afterwards are detailed in this 1934 Nazi film. A rather curious film put out by the Nazis, which has very little to do with the title. Sure, the bishop pays a visit to Halle and one can see he has nothing against the Nazis … quite the contrary. But most of the film seems to have something to do with the wedding nuptials of some royalty at the local St. Moritz Church. NS documentary about the Day of Remembrance and Honor to those who fell in the Beer Hall Putsch in 1923. The upper crust of Germany’s leadership walk to Feldherrnhalle and lay wreaths and the names of the dead are read out … but why Horst Wessel’s name is mentioned and why there’s an honorary column with his name on it when he died seven years later in a street brawl is anyone’s guess. An amateur photographer captures the city and the events surrounding the abovementioned visit. Propaganda film of the sixth rally of foreign-residing Germans, who all came to Germany to celebrate their Germanness; the New Reich; and to party hardy with their overseas cousins. Rudolf Hess makes a big show of telling them that their host countries shouldn’t feel insecure about they’re being loyal to an aggressive state, which has been licking its lips everytime it looks at its neighbors. Uh huh. The significant events of 1938 – 1939 are presented here in excerpts from Wochenschauen. Simply a private color film from 1939, showing some public sporting event somewhere in the Reich. A memorial film put out by the National Socialists to honor the recently deceased Dr. Fritz Todt. I know, we’ve introduced several films about Dr. Todt recently; but with his death, I promise you, this will be the last film about him you’ll see put out by us. More than three-hour long “excerpt” of the trial of the July 1944 conspirators against Hitler’s life. This documentary concentrates on amateur films taken during the Reich years and emphasizes how politics played little part in the amateur photographers pictures … until the War broke out. Film montage documents the closing years of the War, when the days of victory and glory were but a distant memory. Twelve short films documenting Hermann Goering’s life and political activities. Moving documentary about the unemployed running a soup kitchen for the benefit of the massive numbers of hungry unemployed people out there. As the film states: “30 cents a day will provide a warm lunch for three people! Become a member of the Union of Kitchen Workers for the Unemployed and contribute your monthly subscription of 30 cents!” A message, which unfortunately resonates all too familiarly to this day. Short documentary film about the construction of a new locomotive in the Reich. Film about young women hired by the NSV to care for young children, the sick, the needy. This particular film deals with their training in dealing with young children. A very heartwarming film, which leaves one wondering at the end about the positive benefits of a community welfare system all must take turns serving in. Another propaganda film along BDM lines, in which the message is beaten home, that a woman who exercises and competes Nordically is not only healthy, but superior to those who don’t. Nice figures to look at, at least. 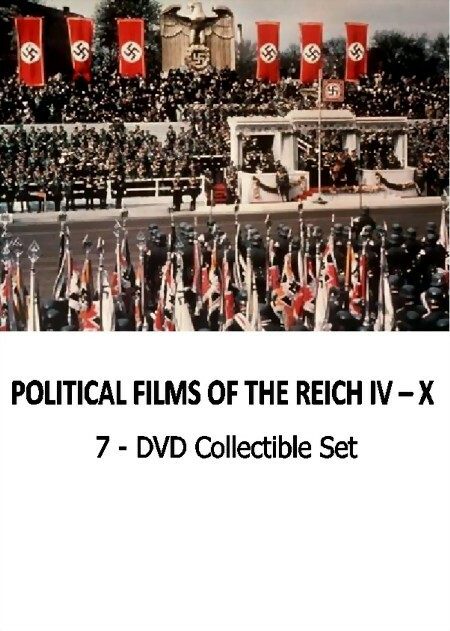 A collection of private films covering a variety of topics by different filmmakers, which show that it wasn’t all fun and wargames in Hitler’s Germany. Dutch-language documentary film about the infamous Leon Degrell, who managed to escape the fate of a lot of his buddies at War’s end by taking a plane away from the battlefield. Useful, if you understand Dutch. Very brief excerpt from a now lost film, which spoke volumes about the situation in Germany in 1943. A man arrives in a town unknown to him and stops strangers to ask directions. Unfortunately, there are so many forced laborers and foreign Wehrmacht volunteers in Germany these days, that no one speaks English. Sort of like asking for directions in most of Phoenix, Arizona.